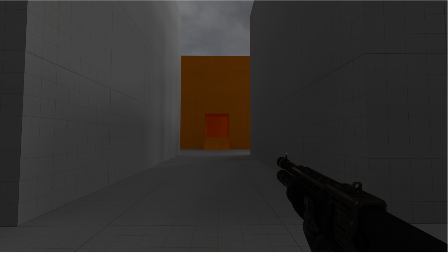 As a final project for my Level Design I class, I was told to make a level in the Source Engine. The project involved making a level about a heroine investigating a city in the far future while being attacked by robots. For this project, I was told to use only developer textures to make a general blockout of the level. As I had no prior experience with the Hammer editor, or many 3D tools, it was a great learning experience. Unfortunately, there were also many issues that I did not know how to fix or work around. What follows is a reconstruction of my design document that I turned in accompanying my level. I’ve added photos of references and a top-down view of the map, as well as some thoughts I had looking back on this, serving as a loose postmortem. Fig 1: The player spawns in front of the Conspicuous Government Building. Intent: The intent of this level was to create a slightly creepy, though not outright horrific, experience for the player. To achieve this, a focus on lighting was made, specifically to guide the player through the space. 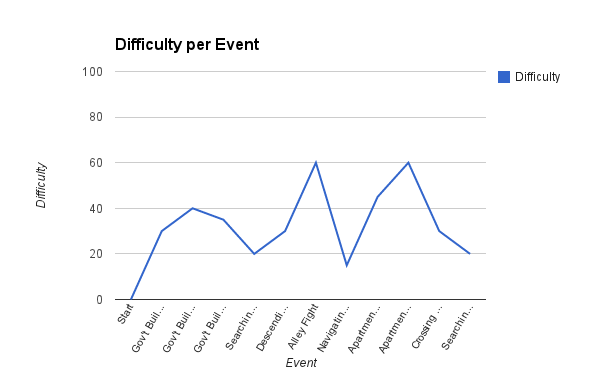 Since no explicit target difficulty was given, a moderate difficulty of 60 was aimed for. Inspiration was also taken from extremely dense urban environments, such as Kowloon walled city and Hong Kong. The bleak tone and claustrophobic environments add to the feeling of unease. Walkthrough: The player starts in front of the government building where the antagonist’s office was once situated. 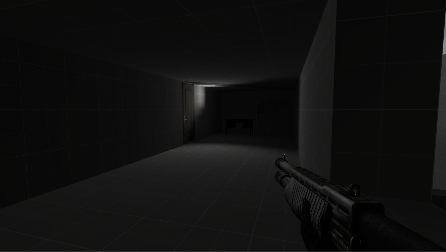 The player is given a shotgun that has one full magazine (6 shells) in it. The player walks up the alley to enter the building. Fig 2: The player’s first encounter with the AI bots occurs on the first floor of the government building. The entrance to the building is also pictured. 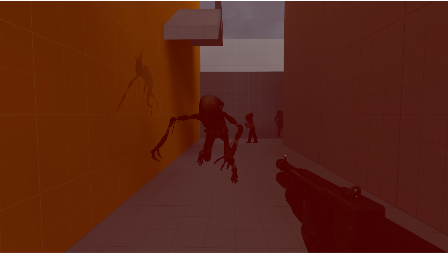 The player turns left around the entryway to see two AI bots charging at them. This encounter introduces them to the basic enemy type that will be present throughout the level, and should take about three or four bullets. Once done, the player moves up the staircase on the far corner of the room from the entrance. Fig 3: The encounter on the second floor of the government building. The player also receives ammunition as the fight starts. 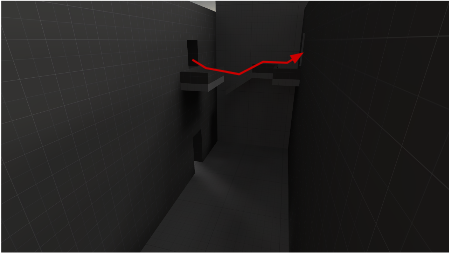 After walking up the staircase, the player makes their way down a hallway to the right. From here, a box of shotgun ammunition is visible. As the player moves forward to collect it, they hear enemy movement behind them. The player turns around to see another standard AI bot, in addition to two defective ones. 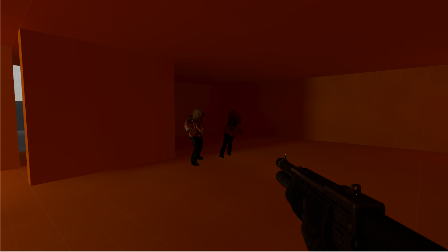 After dispatching them using the ammunition, the player moves up the staircase farther down the hall. Fig 4: The encounter on the third floor of the government building. To the right is the door to the antagonist’s office. The player turns to their right to see three standard AI bots in the office’s reception area. After dispatching them, the player enters the office. Fig 5: The antagonist’s office. To the left is the window that the player exits through. The player enters the office, only to find it empty. Searching through several objects in the office, the player finds out that certain documents were moved to the antagonist’s apartment. Finding an official document with the address on it, the player heads out to find it, exiting through the window. Fig 6: The fire escapes leading down to the alley. The player’s path is illustrated. Fig 7: The encounter in the alley with the new type of enemy. 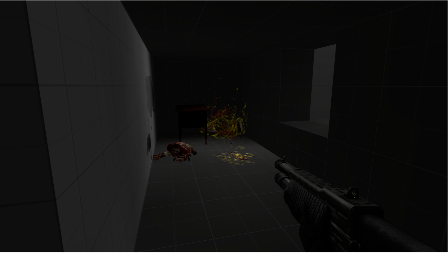 A box of ammo is behind the player. The player moves through the window to find themselves on an old rusty fire escape. Looking left, the player jumps to a lower fire escape, and down to the ground below. Once on the pavement, the player hears movement in the alley behind them, turning around to see more AI bots. The player is introduced to a faster version of bot in this encounter, along with encountering two standard bots. 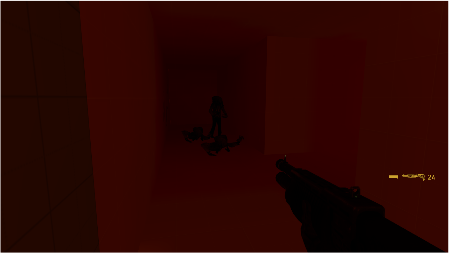 The player should be running low on ammo at this point, so another box is located in the open area in the other direction. Fig 8: The entrance to the apartment buildings, and the fire escapes that bridge them. The player’s path that is taken later is illustrated. The player turns left down a street, and comes to the entrance of the apartment building. From here, the player can see the antagonist’s apartment, but finds that there is no door on this side of the building. Entering the other building, the player sees a staircase to their left, and climbs up it to the second floor. Fig 9: A flickering light behind a door is found on the second floor of the apartment building, behind which are two enemies. The stairs upward are pictured on the right. 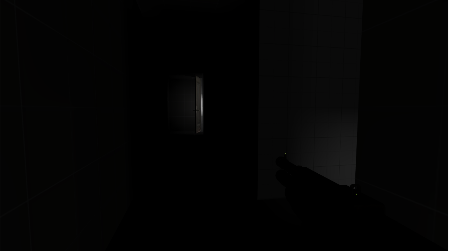 Turning around the corner, the player sees a flickering light coming from behind a door. This encounter can actually be skipped if the player chooses to continue to the third floor. 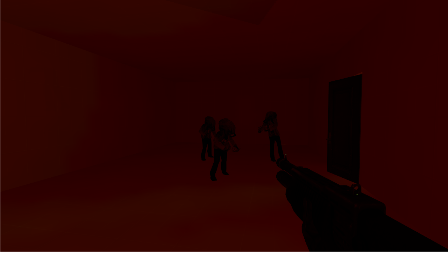 If the player chooses to engage, they will trigger an encounter with two AI bots that emerge from behind the door. After defeating them, the player turns around to ascend to the third level. Fig 10: The third floor apartment, where the final encounter in the level takes place. The window to climb out is to the left. Climbing up to the third floor, the player enters the apartment there. The player opens the door to find a defective AI bot, as well as two new spider-like bots that are more difficult to kill. 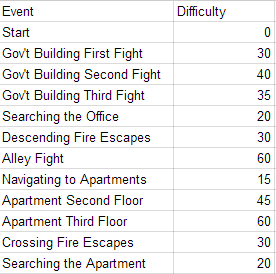 After thwarting them, the player exits through the window and crosses some fire escapes to the antagonist’s apartment. The player can also search the desk here for the former tenant’s observations of the antagonist. Fig 11: The antagonist’s apartment. The desk is on the far side of the room, along with the exit door. 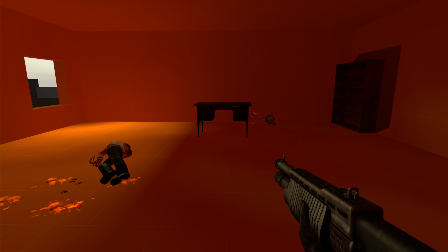 Climbing through the window, the player sees the antagonist’s desk on the far side of the room. Searching through it, the player finds pictures of the hero and some records, both from before the tower incident. The player exits through the door, and is teleported to the next alternate version of Altonia. Reflection: A. Flow of space was a factor I found myself looking at more and more while making this level. The direction that the player travels in often leads them through to the next area. 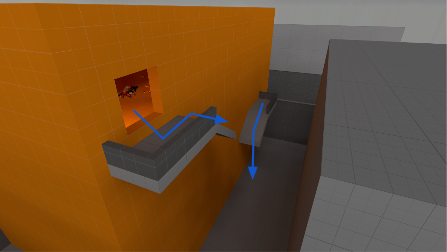 One example is that I switched the direction of the staircase in the apartment from counter-clockwise to clockwise, in order for the player to see down the hallways better. B. One stress that factored into this was the close-quarters combat. Having designed the spaces to be small and claustrophobic, I found that fights within them were more intense than usual. Added to this are the faster-moving enemies later on in the level, and at points, a low ammo supply that the player must keep in mind. C. The level introduces a succession of enemies, one at a time. Basic AI bots are introduced first, followed by defective, fast, and spider ones. Some platforming is also introduced, but not as much emphasis is placed on that. D. My plan to use lighting to guide the player was largely successful. Environmental lighting also helped (and hindered), as I found that it interacted with light entities in interesting ways. Still, my lighting skills need to improve, as many of the interior environments are too dark, bordering on non-functional. E. As mentioned before, the changing direction of the staircase helped with the flow of space. The interior of the government building was changed as well; the third floor used to be one giant room, as opposed to one large room, and a reception area wrapped around. This also helped with the flow of space, and made a distinction between the events of the third fight and searching the office. 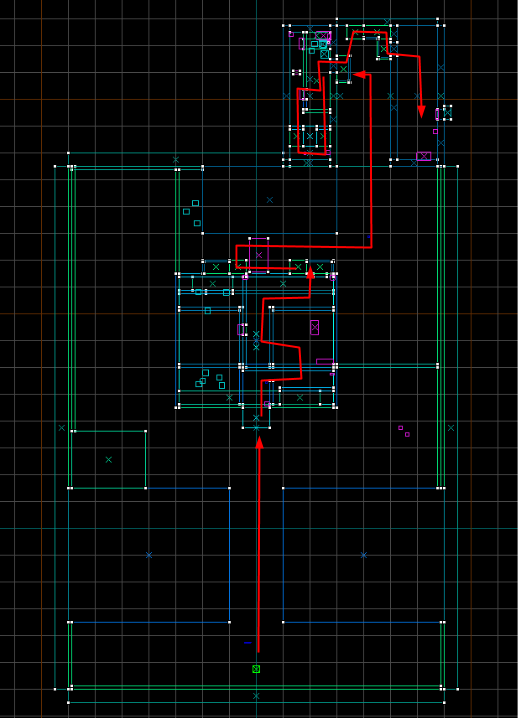 Fig A1: A top-down perspective of the map, with the basic player path drawn in red. Fig A2: An illustration of Kowloon Walled City, which served as inspiration for the level. Kowloon was at one time the most densely-populated area in the world. As mentioned in the reflection at the end of the document, I was not experienced with how to light a level. This comes across in the screenshots as well, with some being difficult to see. Problems with using enemies were also present. I kept having issues with enemies not moving unless they could see the player, which lead to some fights being passed by without incident. I was not aware of using the ai_node and npc_enemyfinder entities in Hammer in order to help fights along. Some fights were serviceable, but none of them came close to the full potential of the Hammer editor’s capability. Still, this project taught me to use Hammer, and piqued my interest in pursuing level design. 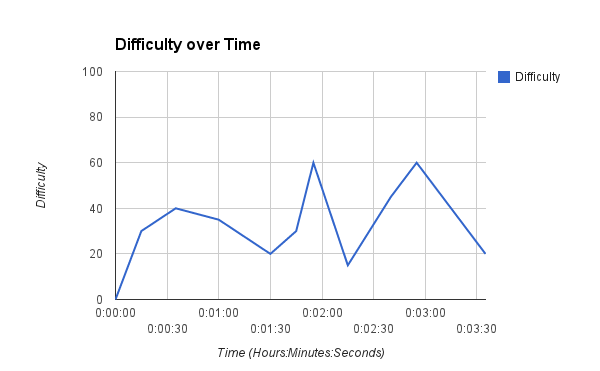 Since my current level design course uses Hammer exclusively, I’ve felt like I’ve had a leg up on my current projects.